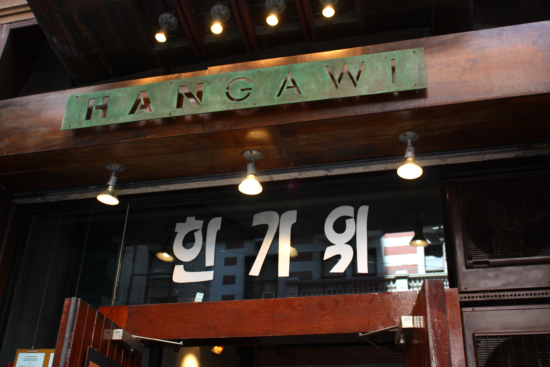 Hangawi – Korean Vegan Oasis in Manhattan? I haven’t had a haircut in ages. I really don’t enjoy the experience. I’m a bit fidgety by nature; and having to sit still for an hour while someone pores over my hair isn’t my idea of fun. That’s why I always have to give myself an incentive. Today the incentive was Hangawi. Hangawi is a Korean vegan restaurant located on the same street as my hair guy. I’ve always wanted to try it. I decided it would be my reward – kind of like a lollipop after a dental appointment. I’m not a vegan. But I eat very little meat – once every few weeks at most; and I eat even less dairy – dab or two of butter on pancakes or in baked goods once in a blue moon. My refrain from meat is completely voluntary, but dairy… ahhhh – that’s another story. I am SO lactose-intolerant – except for the occasional dab of butter. I am also SO in love with dairy. I.MISS.CHEESE. Stinkier the cheese, the better. Oops, I digress. So I’m always on a lookout for a great vegan restaurant, where I can forget about my dairy deprivation. Hangawi met the bill on paper. I was excited. Hangawi’s atmosphere is, in a word, Zen. It also adheres to traditional Korean customs. Shoes need to be removed before entering the dining area. 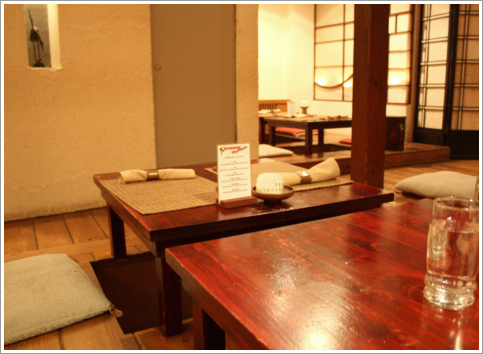 And the traditional low tables (“bapsang”) are accompanied by floor seating on silk cushions. Apparently, the floors are heated during the winter – just the way the Koreans used to do it during chilly weather. Nice touch! My dining partner (my husband) and I decided to start off the meal with the Kabocha Pumpkin Pancakes with Mung Beans served with a ponzu-sauce-like dipping sauce. They were crunchy on the outside and soft on the inside, as they are supposed to be. They were really delicious. But there was no taste or texture of mung beans at all. And they used so much oil to pan-fry the pancakes. Don’t get me wrong. I would eat just about anything deep fried. But I would have liked them to make a little more effort to make the dish healthier. After all, Hangawi is known for its health-conscious menu. My husband and I both decided to try soup dishes. My grandmother always told me that you can tell a great cook from a mediocre one just by tasting their broth. 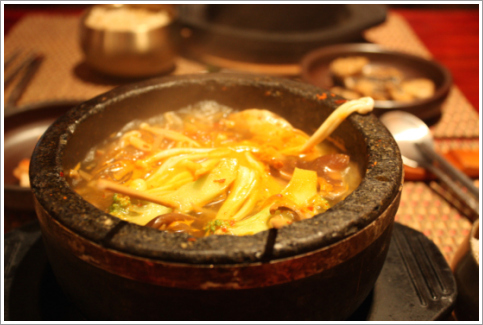 So we ordered the Spicy Mushroom Stew and Yukgaejang (Korean Spicy Vegetable Hot Pot). Both tasted OK. And they contained lots of fresh-looking vegetables. But they were, at the same time, disappointing. The broth tasted too close to water – like gochujang or gochugaru was added to plain water. Vegan broth can taste full and rich when done right; and this wasn’t. Additionally, the soups didn’t quite taste authentically Korean!? Korean-Lite would be the best way to describe it. All in all, it was an average experience. 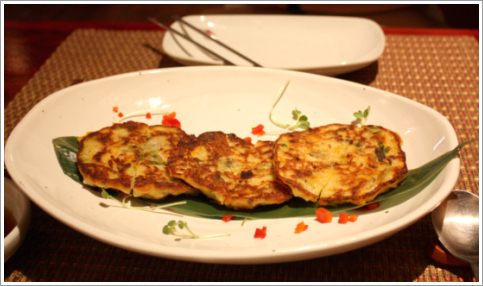 With the authentic atmosphere of the restaurant and a buddhist monk I spotted eating at the back table, my expectations were sky-high. When I was very young, my grandmother would take me to a buddhist temple in the mountains. While there, we would have the most amazing vegan meals prepared by monks. I know. Unrealistically high expectations. But even taking that into account, the flavors left me wanting. Unfortunately, it wasn’t the vegan haven I was hoping for. The Heiress - Progressively Backwards?